A mere finger shred on the guitar chords does not make one a great musician. It has to come from within as if you’re tugging on not just the guitar strings, but the chords of your heart. It is only then that the noise turns into music and profound melodies are created that resonate in the air, casting a soulful impact around. Judging by this precise criterion, Chris Impellitteri has aced his job! Chris Impellitteri is one of those rare guitarists that vent out their internal restlessness, noise, rage, and anger by pulling out on the guitar chords and squeezing out tones that seem to touch and enthrall the minds and hearts of listeners. However, Impellitteri had made a notable hinting teaser about the grandeur he was to achieve through a black EP that he released in 1986, simply titled the ‘Impellitteri.’ While not technically a full album, this was the release that established the band’s sound and is heralded by guitarists all over the world. Their premiere presentation was an immediate hit, and his unique style and signature vibrato were perceived to be of grandeur that matched with the likes of the notable music maestros of that time and even more. The success of his EP and Frits Studio Release kick-started his career into high gear, establishing a credible profile with a myriad of music accolades and awards. He was officially declared as the ‘Fastest guitarist of all time’ by Guitar World Magazine in 2008, making him stand on a legendary plane with the likes of Yngwie Malmsteen, Eddie Van Halen, Randy Rhoads and other maestros in the fast, heavy metal genre. A mere look at his discography, rig rundown and the style that only evolved to get better with time is a testament to the fact that he not only made it to the legendary bars but also elevated his celebrated stature to a height no one thought he’d be able to achieve. 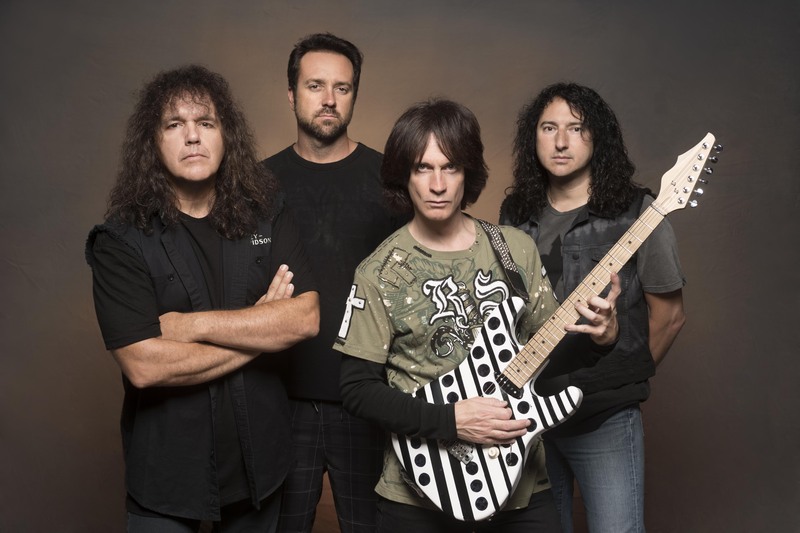 Here we share the tidbits of the recent interview that we had with Chris Impellitteri to satiate the cravings of his loyal fan base. The ‘fastest musician of all time’ was humble enough to spare some time out of his fast and busy schedule to touch upon the various aspects of his entire career and enlighten us with his thoughts, views, and experiences. Yes. It didn’t exist when I was a kid. I went to school actually with the two kids; I think it was their family got the funding and got all the permitting and went thru the legalities to create it. It was crazy because I went back in like seven years after graduating high school it was a completely different place. Yes, that’s pretty much how Foxwoods is, and a lot of concerts go on there. Mohegan Sun has got the arena but Foxwoods has this small amphitheater, and that’s where a lot of the hard rock groups go and play their concerts at. Yes, I think I’ve seen some of that footage, you know in that place. I used to be managed years ago by a man named John Sheard he was a really big concert promoter like in New Jersey and New York City in like the Meadowlands and Madison Square Garden. One of his partners was a guy Jimmy Koplic. Jimmy did all the shows. I think eventually he ended up doing things for Foxwoods directly. Yup Jimmy Koplic and Shelly Finkel from Cross Country Concerts. We’re going back in time there. I still got my ticket stubs. Well, Jimmy, yes, I know Jimmy but Shelly he stopped many years ago he promoted Evander Holyfield the boxer he got out of it, but Jimmy stayed in it. I think he still does that for Foxwoods directly. How did I start? Well, the truth is and then again not due to violence or anything like that. So, when I was nine, I lost my parents you know. So that was basically how I began. I wish I had a cooler story, but that’s the truth. When you started playing in your teen years did you have any like little bands that you belonged to or did you do anything to make yourself known outside of where you grew up? Well yeah positively of course! Like any kid playing music, I started in 7th grade. I started like dances in high school, we were doing covers doing anything from Van Halen to Foreigner and that stuff. You know we would do covers, and of course, we’d do all the local keg parties. Anything we could do, we would play. A lot of house parties. I remember the backyard parties, you know. Do they still call them keg parties? Well back when we were kids, basically kegs of beer in the back yard on Saturday night and 1,000 kids would show up from high school so we would always be the band that would play that. You know so I did that all through like 7th & 8th grade started doing the dances, 9th & 10th grade I was doing that and honestly by the 11th grade I was playing in the bars. You know, I was sneaking, I was playing with all the guys, you know I was playing, and they used to sneak me in, get me up on stage, and I’d do my thing, then, of course, take me out of there. So yes, I did that for years, and that is actually how I met Rob Rock. Yes, that was in my teens. That’s probably around; I think I must have been 18 or 19 or something like that when I joined that band. I almost didn’t graduate high school because of it. How did you go from that band to your band with Rob Rock? Because the Black EP is like Holy Grail in the guitar community with others. That was your beginning record. Well Rob and I after that QT Hush band, we actually were on the New England circuit you know. We would play all the places in New England. We had a band called VICE and it was probably about 75% covers 25% was original music. It didn’t really, we didn’t really push. It didn’t go anywhere really. The label that Ozzy Osbourne was on at the time that was called Jet Records. The first two Ozzy records it was for Diary of a Madman and Blizzard of Oz and they were going to sign us. Bring them to LA, to be honest the band hated me! Because I was so driven. They wanted someone that was going to be more pop, you know. Someone that was a little more. I think I was a little too, probably because I was 18 years old and I was full of fire. I just wanted to do it my way, so anyways, they fired me. I went to LA so I figured, screw it. Mainly because I was always pushing them to be better. Yes, you know, I wanted to practice 12 hours a day play as many notes as I can, at that point I just wanted to play. I didn’t realize at that time, oh there’s this thing called pace and melody. Anyways, I went to LA then I don’t know what happened. My bud Rudy Sarzo was in a band. Anyways they were looking for a singer and they had done a bit of reiteration to the band and they called Rob. Rob Rock eventually got the gig. They did a record. Unfortunately, it didn’t go anywhere, they couldn’t get signed at least to a major label so Rudy and Tommy Aldridge quit, they went to Whitesnake. Rob needed a gig and at that time I was literally writing the music for the Impellitteri Black EP and I was really into at that time I mean you know it’s funny if I look at this thing in perspective and open eyes when I first came out and I get it believe me is the Yngwie, you know I get accused of being a clone, you know like oh you’re ripping him off or whatever, the truth is, it had nothing to do with him or the whole Shrapnel crowd that Mike Varney had which is really a guitar person I really love. It was really like a band like Iron Maiden, Judas Priest a lot of the British Metal scene but I loved the really fast double kick stuff and I started playing around with that and of course I really had a huge love for John McLaughlin & Di Meola had a huge influence on me so I just started blending all of those different styles you know and that’s literally how the EP came about. We did it at a place called Baby-O Studios and I’ll never forget it because I was recording it and in Gene Simmons from Kiss came in. It was really cool, I was this kid, you know. I was in a studio, we were creating. You know musically I don’t know what it was I still to this day get a lot of compliments. I’ve had bands, huge bands, tell me, hey man we got that Black EP and we love that thing. I’m like, how do you even know about it? Oh, that’s cool! I got to be careful about the video thing. I did do a video which there’s one video out there and it’s horrific and I’m so ashamed of it. There’s a thing I did with this company I think it’s called REH I think it was called, RH Video? Oh, dude, it’s horrible! I was literally like it was probably part of that period where you start getting some success and you’re partying all the time and experimenting with things believe me when I did the video I was heavily experimenting with some chemicals and dude I look back and think, I don’t play guitar like that and why would my manager even allow that to be released. I’m just simply masturbating all over the guitar and it’s senseless! So even I would call myself wanker, I mean come on. Yes, I can hear a lot of Al Di Meola stuff in some of your music, and that’s what I was going to ask you. Is he one of your more significant influences like some of the other’s you’ve mentioned? So I’ve experimented, and I’ve broken as many rules as I possibly can, not always for the better, but the reason I wouldn’t pick a lot of guys that do more like economy picking. Yngwie does a lot of it Paul Gilbert does a lot of it, and it works good, and I love the way they make it sound, but for me, I wanted that Staccato that percussive tone alternately you get when you’re using heavy picks. I mean apparently when you want to play heavy with your wrist for some reason I just couldn’t get that snap. So basically, I would find myself breaking the rule and going to the forbidden zone which is not only using your wrist and your index finger and thumb in the circular motion then you’ll also start to use a little bit of your elbow which is forbidden. You know what I mean? That Black EP is one record, I and many others go back and listen to many times over. Yes. I do believe the Black album ?? sticks to the hands of time. I just wanted to comment on something about people saying you’re a big Yngwie clone. I’m a big Yngwie Malmsteen fan, and you guys have two different styles. You’re each your person. So, I would disagree with them about that. Well Thank you and listen to people never for some reason when I say Yngwie absolutely in some manner affected the way I play but It’s unfair to say Eddie Van Halen didn’t or Randy Rhoads I mean come on. Biggest influence is every guitar player, I mean if you’ve played a song or I’ve heard a demo from you at some point, you’ve probably influenced me. I used to always laugh at that and I got it. I was playing a strat, I was wearing the white boots you know in Stand in Line you know what I did with Bonnet and but the funny thing was, the people that were condemning me for it was like ‘dude this is hilarious, you’re not realizing what we’re doing’ and the Standing in Line video I’m actually playing a Richie Blackmore model and it was such a tribute to Rainbow you know like a watered down Rainbow that we were literally almost dressing comically you know, kind of like Rainbow. Then everybody goes, you look to rip off Blackmore, I’m like actually those would-be Blackmore guys which means, somebody else is ripping off Blackmore. Yes, that’s the one guitar and dude it’s insane! You know, I mean it’s all hand built. It’s unique, you know it’s one piece maple neck, but you see like the in lay or the center dots are all rosewood, and the side markers are all brass. You know the body, typical, I think we’re using ?? on that one, but sonically it sounds impressive. I’ve got a ’58 Les Paul I used a lot of my recordings, and this thing sounds equally as good if not better. It’s different because Charvel sometimes has a compound radius this has a 12-inch radius all the way down pretty much like a Les Paul except with Fender. No. Sorry dude! No! The closest thing you’re going to find to me doing this, you know I’ve done signature guitars for Fender but mainly in Japan only. Now Charvel is different. Charvel, the blood splatter guitar, that’s pretty much what I’m working with. Now the paint job forgives me; I didn’t do that it was already done. You know, I don’t care it sounds so good and plays so well through my Marshall stacks. No! That’s another guitar we were building. No, no, no that’s like I don’t know if that’s a Charvel body and some strange neck I was building it literally in like my garage or whatever. No, and I was actually having fun with that because basically did the graphic where we went well you can’t really do anything unique right? Because Van Halen has done everything you can possibly do with graphics, right? And so, I said for my love of Eddie and Randy why don’t I just do both? So, I basically did some stripes and some dots, polka dots and it’s on the cover I think of the new Venom record. And that guitar actually had a crazy neck on it. We did one record. Impellitteri Black EP kind of gets noticed by the industry, you know especially in Europe. I’m going to get to your answer really quick. I’m just going to try to give you a quick evolution. So, we did the Black EP which at that time it was advertised everything guitar. Really popular magazines like Circus Magazine you know they all have them like the inside covers there’s a lot of advertising and I think it was Kerrang! Magazine in England and that’s where this whole stupid fastest guitar player in the world thing, at least for me, started. They called me the fastest guitar player in the world it’s some stupid crap right. All of a sudden from Japan everybody noticed us from the Black EP and then Rob Rock quit and I was screwed. I was like Oh my God what are we going to do? I don’t have a singer. So, at this time Sony and Relativity that’s where Joe Satriani and Steve Vai got signed for their instrumental records, they signed me. I didn’t know what to do, I just wanted to get this Black EP out and tour behind it and they were like, Yes, but we need you to go do another record so we ended up calling Graham Bonnett, because Graham had ended up calling me gosh probably two years earlier to see if I would be interested in replacing Yngwie when Yngwie was in Alcatrazz. So basically, I went and did the Stand in Line record, which by the way I really don’t like. I’m not a big fan of it. I don’t. Cause listen, I was playing with a bunch of older guys. We were almost 15 years old or something if not more. I didn’t know what to do. I was a heavy metal kid and the only thing I could think with Graham is why don’t you do something like a light sort of version of Rainbow and really that’s what I hear it as. You know I hate guitar tone and it’s buried in reverb and I had no say over it. With the Impellitteri Black EP, I was very involved with everything from the playing, the recording, the production. Stand in Line I felt like literally it’s got my name on it but I have no control over this. You know what I mean? So there, we’re coming into the 80’s and MTV starts playing our video a lot Stand in Line which I do like stand in Line to this day. It was just too big of production but I like the song. So, we started doing MTV and I guess we were in the eye of the media and we were getting a lot of coverage and Japan all of a sudden really really take off for us. You know like really big. And I know like that when people say oh when you can’t make it in America you’ve got to go to Japan you’ll be a rock star right but for us all of a sudden we were playing arenas, masses. Not like the smaller version would go to Japan and play clubs. You know our first show was at the Tokyo Dome. So, we were doing really big things and that kind of gave us life. Even though what was about to come around the corner is grunge right? Impellitteri, so thank God, we do that, it sold, Ok. We probably sold like 50,000 records or something like that in Japan, not very much. The label they said look, we’re going to give you one chance, you need to go back to your roots, more like the metal stuff. We did an EP called Victim of the System for Impellitteri and that’s only released in Japan. But we’re getting more back in the direction of our Impellitteri Black EP and from there on in we just started being true to ourselves and kind of developing from the Black EP as we should have always done. I know it’s a really long answer to your question about the grunge thing did make a change but that was kind of I don’t know if it’s a good answer but that was the evolution. There was a little bit of change really quickly and then we realized, we’re deviating, go back. Definitely! Definitely. The Answer to The Master that’s a perfect example where you see like you know we’re getting thrown in with guitar players like I said I love all of the shredders and all of these instrumental guitar players, but we are never one of those guys. So, Answer to The Master you can hear it. It’s more about the riff more about the band never mind the guitar player, if that makes sense. I mean it has moments you know where you’ll see shredding but a lot of times it’s not the focus by any means. It’s really about metal, the riff, the melody the song, the hook. When you went after you guys did that you went to Screaming Symphony, did you stay the course there too? Yes, of course! I was endorsing them for a while. I was using the Powerball’s which I like a lot. Yes, that is all I am using, yes. And like I say, mainly it’s always vintage Marshall heads. You know I like plexis. The cabinet’s I use differ. On Venom, I was using both cabinets with a Celestion 25-watt Greenback and also Vintage 30’s. So, I would do that, and there were times with something on like with Venom where if you wanted a little more depth what I’d do is I’d add a 30:20 electrifier, just to triple track and bring it under the other guitars just for a little more body, depth. I did that a lot especially on Wicked Maiden as well. Yes, well, first of all, we’d been friends first. You understand we grew up together playing in the bars together so as you’re maturing as a musician right you’re learning; you’re mastering your craft. Every time you do that if you’re doing it with someone like a team player your evolving but your understand how each other develops musically and how they write and what their style is like. So, for him and I, it’s just natural. It’s just so easy. I know when I’m writing a song I will always send Rob a vocal melody. You know cause you’re a guitar player. You know how it is. You’re playing guitar, and you’re writing something, there’s a voice in your head, and you’re singing, right? So that’s what happens. So basically, as I’m singing that voice in my head you know I’ll lay it down in a demo and give it a quick vocal guy, give it to Rob because I already know how he’s going to sing it and then you see if he likes it or he’s got something better he just takes it his way, and then we get back together, we practice, go into rehearsal and work it out until we think it feels natural. So, it’s great working with him. It’s easy, and there’s no drama he’s a great guy. The Venom album did you do anything differently regarding writing processes with Rob and the band or was everything just the same musically? Well, I hope so, yes! You know I just wrote another cool song the other day. Right now, we’re working on something called Warhead for Impellitteri. Next year is our 30th anniversary so you know I just got off the phone right now with a guy who kind of manages and is the agent for Twisted Sister. So, it looks like next year we’re going to try I’m not saying certain what is going to happen yet but we’re going to try to go out and do a full-blown anniversary tour. You know we just got back from doing some really amazing festivals in Europe and Asia. So hopefully we will keep this going. Especially next year since it is the 30th anniversary of the band. Your 30th-anniversary tour, are you going to be touring the states with that? You know honestly, I’ve wanted to tour the states for 15 years. It’s really up to demand and the promoters. I don’t really know if you know what goes on behind the closed doors of this industry. A lot of it believe it or not is who you know, who’s managing you, who the agent is and 90% of these big festivals you see in Europe are all bands on there that are bought to be put at those festivals and it’s usually by a record label, like back in the past maybe it’s like a roadrunner: Hey I’m putting all my bands on this label or on our label to be at this festival. So, the same thing happens in the states with its promoters. They’re looking for: hey how many videos do you have? What’s your twitter account? And dude, I am the worst, we have never embraced social media. We don’t even, I don’t even think we have an official page. People have hijacked my name. There’s a bunch of Facebook pages. I do have one that I recently got that I think it has a 7 in my name like Chris Impellitteri7 or something like that on Facebook and I do that but most of it is done by other people and we can’t even get our own page back, like Facebook, Impellitteri, I don’t even know who that is. I’m sorry, where I was going through with the United States, promoters look at this stuff. So, they don’t really care if you’re good or bad. All they want to know is do you have ten million Twitter followers? Are you with the managing company who also manages Brittany Spears or whoever because then there’s some sort of package they can negotiate and get you on. You have to understand a band like us, we have a good strong cult following around the world. I’m sure in the United States because we have done warm-up shows in LA where literally we didn’t even do an announcement and we’d get to places where we are playing and there’s a line around the block for people waiting to get in and we’re like Jesus!! So, we don’t know how to convey that with promoters in the United States. So, a lot of times they are going to try to promote us in some small club and unfortunately we’re not a club band. We don’t want to do that. You know we’ve always played theaters, arenas, stadiums. America is challenging. I can say we want to go out on our 30th-anniversary tour it’s really dependent on the new agents we work with this year. We’re going to try to see if they can make it happen. We will definitely go out and do Europe and Japan of course, the U.S. I’m not sure. I hope it happens, but you know, I’m not holding my breath. I understand. Do you have a picture of that Charvel? Is that going to be your signature guitar? Or have you even thought about talking to them yet? Why don’t you design your pickups? I’m sure a company has offered. You know it’s interesting you said that because weight remember is critical. So, for me I guess this is really plagiarizing Van Halen’s word, I am also a tone chaser and believe me I am a studio nut. I’ve owned major studio’s in Los Angeles and I have a major studio in my house. I’m not talking about the little pro tools only thing. I’m talking about big rigs and SSL’s and all that and for me personally I am absolutely addicted to tone and I find the heavier guitars, it’s probably why the tracks I do especially on Venom we’re talking about the new stuff but now I’m using the Charvel mainly but for Venom 90% of that record is my 1958 Les Paul which is heavy. You know even the title track of Venom is actually I’m using it in the video it’s called Face the Enemy that’s the Les Paul I recorded all the record on and that thing is a tank. It is so heavy. Your left should be just killing you after it. You’re like oh my God this thing is so weighty! Now do you hear a difference tonally? Now it’s hard because Michael’s guitar has a humbucker while Yngwie’s has a single so the humbucker is going to have an advantage immediately because the width, the coverage of that pickup really acoustically, which one has the better tone?